The focus was on defense going into Monday’s national title game between Texas Tech and Virginia. 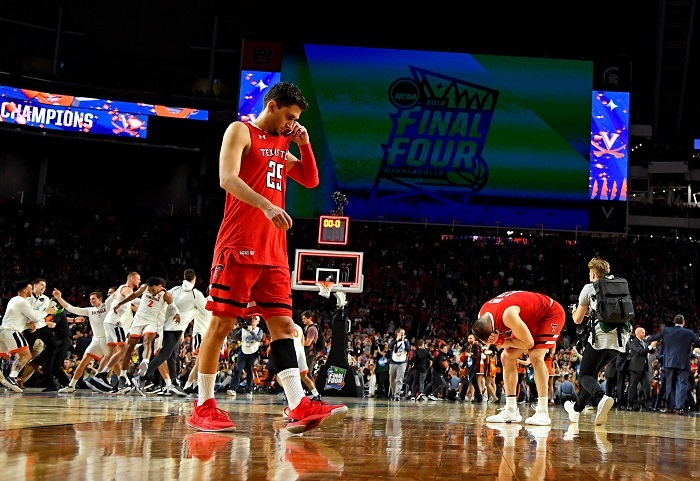 Instead, both teams scored more than 70 points and the Red Raiders were unable to overcome the Cavaliers in overtime, 85-77, in an attempt to win their first national title in men’s college basketball. 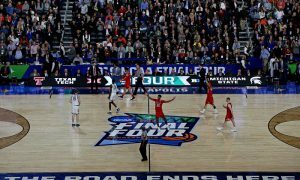 Instead, Virginia (35-3) won its first national title in men’s basketball in a game that saw Texas Tech (31-7) overcome a double-digit deficit in the second half, Virginia tie the game in the final seconds of regulation and then Virginia make 12 free throws in overtime to seal the title. In overtime Tech had an early lead after Matt Mooney’s bomb of a 3-pointer in the first minute and he made another absurd turnaround jumper after basically being double-teamed on a failed drive to the basket. But the lead didn’t last long. Kyle Guy, who scored 24 points, made two free throws to cut the Tech lead to 1. Then, with two minutes left in overtime De’Andre Hunter — who had a career-high 27 points — gave the Cavaliers the lead for what turned out to be for good at 75-73. Tech thought it had an opportunity to tie the game with about a minute left. Ty Jerome, who had 16 points for the Cavaliers, drove the basket and missed, but Virginia knocked it out of the paint and downcourt toward Tech’s end. Davide Moretti tracked the ball down but had it knocked loose by a Virginia player. Texas Tech was originally awarded the ball. But, after replay, the officials awarded the Cavaliers the ball, as they ruled the ball went out on Moretti. From there, the Cavaliers just kept making free throws and extending their lead as the Red Raiders were unable to bridge the gap. At one point the Cavaliers were on an 11-0 run in overtime. 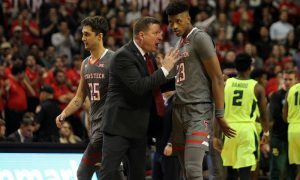 In regulation the Red Raiders struggled with shooting, fell behind at halftime and nearly lost the game entirely as they fell behind by as much as 10 points midway through the second half. At times it was Brandone Francis, Tech’s senior guard coming off the bench, that carried them. He had 17 points. Kyler Edwards, another guard off the bench, had 12 points. 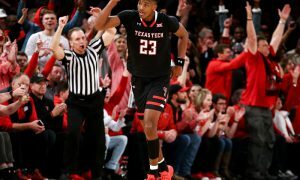 That made up for the fact that Jarrett Culver, the Red Raiders’ key offensive player, needed 25 minutes to make his first field goal. But once he did, the Red Raiders started to work their way back into the game. Culver finished with 15 points. With 4:47 left in regulation the Red Raiders were down 6. From there, Mooney canned a 3-pointer — part of his 10 points — to cut the lead to 3. On the next possession Norense Odise scored a layup and drew a foul, leading to the under-4 media timeout. He came back after the timeout to make the free throw and tie the game, ending an 8-0 Tech run. Virginia pushed the lead back to four points, 65-61, with 1:40 left, before Moretti — who scored 15 points — knocked in a 3-pointer with 1:31 left. Down 1, the Cavaliers looked to extend their lead. But Hunter’s drive was blocked by Odiase and the ball went out on Virginia. That was confirmed after replay. On the other end, after a Francis miss and a tie ball that led to another Tech possession and a fresh 30-second clock. Culver then made a beautiful layup to give Tech a one-point lead with 35 seconds left. Jerome then missed a jumper, Odiase rebounded and drew a foul. He made both free throws to give the Red Raiders a 3-point lead with 22 seconds left. All Texas Tech needed was a stop. But Hunter drained a 3-pointer with 12 seconds left to tie the game, and the Red Raiders were unable to win the game as Culver’s jumper in the final second was blocked by Braxton Key. The first half was strange for Texas Tech. The Red Raiders failed to score a field goal for the first seven minutes, but didn’t fall behind by too much because their defense kept the Cavaliers from running away with the game. Tech’s first field goal came at 12:38 in the first half with Davide Moretti hitting a 3-pointer. But that seemed to spark the Red Raiders back into the game, as they scored 29 points in the final 12 minutes of the first half, momentarily taking the lead. Along with Moretti, who scored 8 first-half points, Francis had a great half off the bench, scoring 8 points, including two 3-pointers to help spark the Red Raiders at the under-8 media time out. Culver, meanwhile, was held to just 3 points. The Red Raiders’ bench had as many field goals as their starters (4 each). Tariq Owens played for Texas Tech after a gruesome sprained right ankle in Saturday’s semifinal. He proved somewhat effective in the first half, but lost that effectiveness after the break and finished with 3 points, 5 rebounds and a block before fouling out in regulation.